Are there any Fact-Checkers at the New York Times? On rare occasions, when I get really irked, I complain about media bias. Examples include this AP story on poverty, the Brian Ross Tea Party slur, this example of implicit bias by USA Today, and a Reuters report on job creation and so-called stimulus. On other occasions, though, you stumble upon a news report or column that is ignorant beyond belief and you have to assume that the person has transcended ordinary bias and belongs in a special category. The Washington Post seems to specialize in this kind of über-mistake. It was a Post reporter, after all, who wrote last year about a GOP plan to “slash” spending when timid GOPers were merely trying to trim 0.15 percent from the growth of federal spending. Not 15 percent. Not 1.5 percent. A mere $6 billion out of a bloated federal budget of $3,800,000,000,000. I guess the folks at the New York Times were feeling left out, because our latest example comes from that newspaper. Someone named Chrystia Freeland wrote an article about income inequality, making some decent points about cronyism, but also reflexively regurgitating talking points on class-warfare tax policy. What caught my eye, though, was this incredible assertion about government funding of education. Educational attainment, which created the American middle class, is no longer rising. The super-elite lavishes unlimited resources on its children, while public schools are starved of funding. …elite education is increasingly available only to those already at the top. Bill Clinton and Barack Obama enrolled their daughters in an exclusive private school; I’ve done the same with mine. So “public schools are starved of funding”? That’s a strong statement. It implies very deep reductions in the amount of money being diverted from taxpayers to the government schools. So where are the numbers? You won’t be surprised to learn that Ms. Freeland doesn’t offer any evidence. And there’s a good reason for that. 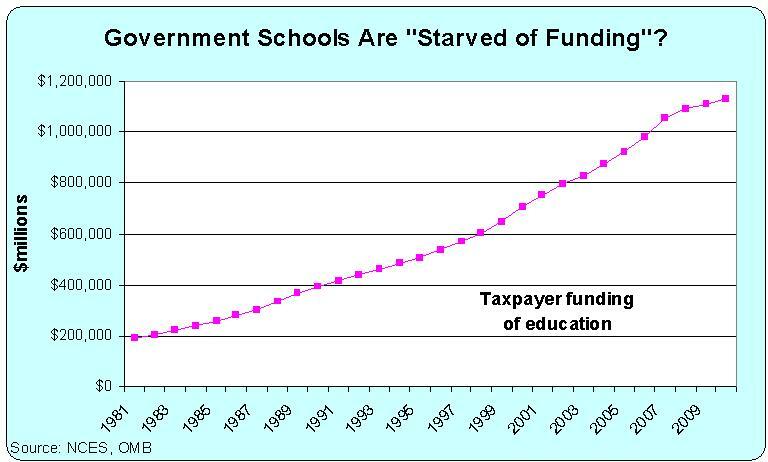 As show in this chart, government spending on education has skyrocketed in recent years. This data isn’t adjusted for inflation or population, but you can peruse this amazing chart put together by one of Cato’s education experts to see that per-pupil spending has skyrocketed even after adjusting for inflation. In other words, Ms. Freeland has no clue what she’s talking about. Or, to be fair, she made a giant-sized mistake, perhaps because she’s lives in a statist bubble and blindly assumes that left-wing politicians tell the truth. Though I do want to giver her credit. She acknowledges that Obama and Clinton both decided to save their kids from a failed government-run school system, thus exposing some hypocrisy on the left. So it’s quite possible that she wanted to write a fair piece, but simply had a few major blind spots. And it goes without saying that none of the editors or (non-existent?) fact checkers at the New York Times knew enough or cared enough to catch a huge blunder. P.S. You can enjoy some cartoons about media bias here, here, and here, with the last one being my favorite. P.P.S. Yes, I know Paul Krugman writes at the New York Times and sometimes seems to specialize in big mistakes. But he’s explicitly an opinion writer, so readers are forewarned to expect a certain point of view. There is nothing new about the New York Times’ playing fast and loose with the facts to serve their political agenda; this is been going on for a long, long time. It was then I realized that political propaganda comes first for them, and that they have no regard for the facts when they would get in the way of their demagoguery.